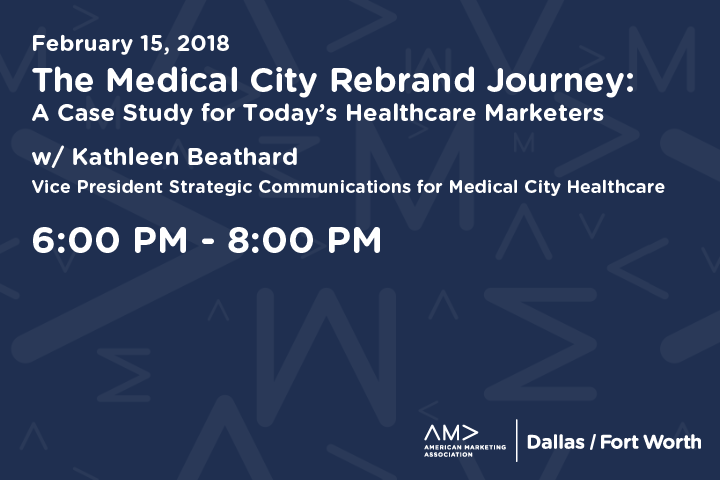 Attend our 2018 kickoff Healthcare SIG and dive into the fascinating case study for today’s Healthcare Marketers; The Medical City rebrand journey. Kathleen Beathard, Vice President Strategic Communications for Medical City Healthcare will engage attendees with step-by-step details, results, and a scalable model. Who Should Attend: Marketers, Healthcare Community, and anyone looking to increase customer retention, rebrand and market with improved ROI of marketing activities, grow Brand Ambassadors and Brand Loyalty. Audience Take-a-ways: About HCA North Texas/Medical City Healthcare; What is the Healthcare Brand Journey? Considering healthcare marketing challenges in the rebrand journey. How to establish a positive experience during the promotion phase? Applying a scalable model. As vice president of strategic communications, Kathleen Beathard directs all aspects of the integrated marketing and public relations programs for HCA North Texas. Recently, she led the division-wide rebrand to Medical City Healthcare. Medical City Healthcare is one of the region’s largest, most comprehensive health care providers and includes 14 North Texas hospitals, seven off-campus emergency rooms, 11 ambulatory surgery centers, 30 CareNow urgent care centers, more than 7000 active physicians and 15,000 employees. Ms. Beathard brings more than 20 years-experience and recognized achievement in integrated marketing and public relations to her role. Her unique perspective includes experience with corporate, nonprofit, and academic organizations. She has successfully met challenges ranging from creating and sustaining a new corporate brand, to results-driven consumer marketing, sensitive crisis communications, fundraising, and digital strategy – growing return on marketing investment year over year. 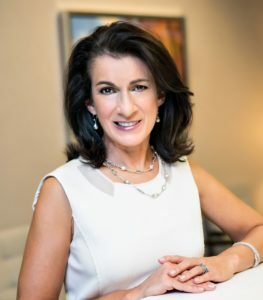 Prior to joining HCA, Ms. Beathard served as vice president of marketing and public relations for Methodist Health System, a Dallas-based nonprofit 1,102-bed multihospital system including six acute care hospitals, a rehabilitation hospital, primary care clinics, and an academic clinic serving disadvantaged patients. Prior to Methodist, she served as chief marketing officer for esoftsolutions, Inc., and for 10 years she worked in marketing positions at Southern Methodist University. Ms. Beathard holds a Bachelor of Arts in communications from Texas A&M University, as well as a Master of Liberal Arts and Master of Business Administration from Southern Methodist University. She is accredited in public relations by the Public Relations Society of America. Visit her on LinkedIn at linkedin.com/in/kathleenbeathard/ or follow her on Twitter @Kbeathard. Enter Building E parking lot off of Merit Dr. The Building E parking lot is on the North side of Medical City. Parking is FREE. Parking passes will be provided at the event. From Building E parking lot, walk through the doors labeled Care Tower E. Take an immediate left down the winding staircase. Follow the signs and arrows to the Building E Auditorium. The doors to enter the Auditorium will be on your left. Register early and save! If you register online in advance pricing for this event is $35 for non-members and $25 for members. At the door tickets will be $45 for non-members and $35 for members. AMA DFW Members ~ don’t forget to take advantage of your DISCOUNT! Enter your member number in the ‘promotional code’ field when registering and save $10! Please note DFW AMA’s refund policy: Tickets are nonrefundable unless cancellation is requested via email at least 48 hours prior to the start of the event.